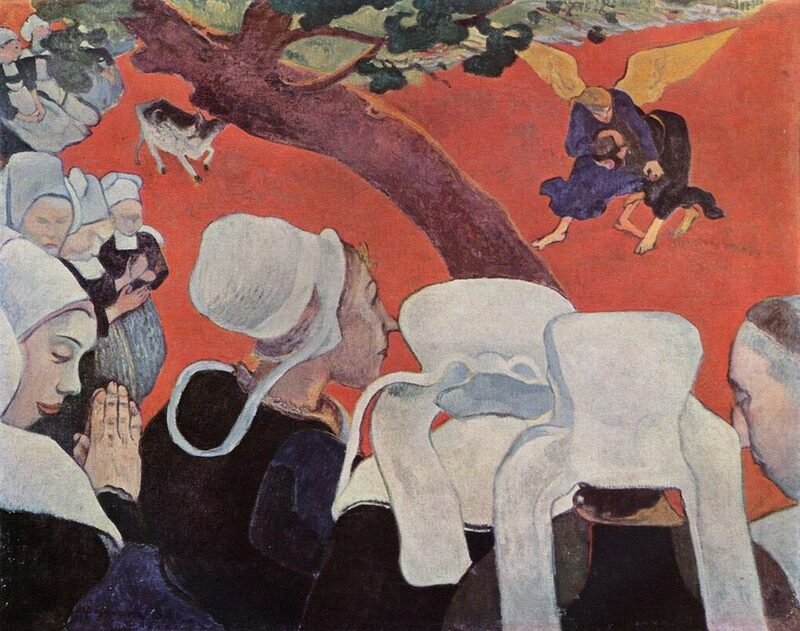 Paul Gauguin, a French artist, created the Bible-influenced Vision After the Sermon in 1888. It was painted with oil on canvas and is currently on display at a gallery in Scotland, Edinburgh. It was created in Pont-Aven, Brittany, France and is one of the most popular Bible paintings. This painting features a scene from The Bible with Jacob and an angel in front of a crowd of women. In the scene, Jacob is wrestling an angel down to the ground. They are on top of a red earth while the crowd surrounds them at the front. This is not a direct image though, it is meant to be a vision that the women see after going to a sermon at their church. Red is the most prominent color in the painting other than the black and white that the church women are wearing. It measures 28.4 x 35.8 inches and is of the style of synthetism.